Let the meal begin! The Amish Aspen Gathering Table can get the party started. 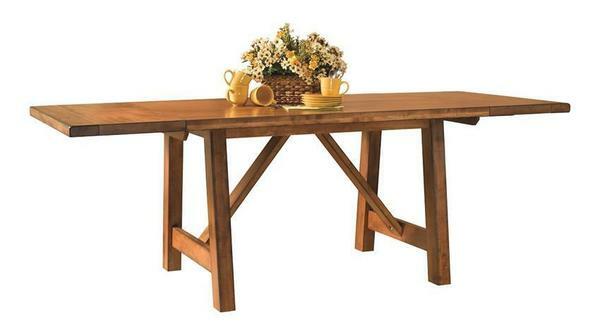 Aspen offers V-shaped beams in the base, a rich thick top and rustic breadboard ends. The added height brings a casual feel, but make no mistake, this table is ready to host all gatherings from casual to fancy. The Amish Aspen Gathering Table is shown here in brown maple wood with antiquated stain. It can be customized in the wood and finish that works best for your decor. We're proud to offer dining room furniture of heirloom quality. It's going to last, perform and look stunning for always. If this is your first experience ordering furniture online, we invite you to read our reviews. We love to help and encourage you to email or call a Furniture Specialist with any questions. Enjoy your new furniture and thanks for shopping with us.